Slim - Joelle Delbourgo Associates, Inc.
Pamela Slim is an award-winning author, business coach and speaker. She spent the first 10 years of her business as a consultant to large companies such as Hewlett-Packard, Charles Schwab and Cisco Systems, where she worked with thousands of executives, managers and employees. In 2005, she started the Escape from Cubicle Nation blog, which is now one of the top career and business blogs on the web. In the last 8 years, she helped hundreds of entrepreneurs to start successful businesses. Pam’s first book Escape from Cubicle Nation: From Corporate Prisoner to Thriving Entrepreneur was released in Spring, 2009 and won Best Small Business/Entrepreneur Book of 2009 by 800 CEO Read. 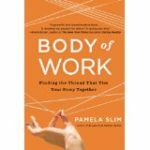 Her new book, BODY OF WORK: Finding the Thread That Ties Your Story Together gives a fresh perspective on the skills required in the new world of work for people in all work modes, from corporate to non-profit to small business. Many of us today will not follow a linear career path. We may have a succession of careers or multiple simultaneous jobs and ventures, including volunteer activities. How do we make sense of all of the things that we do in the world of work? Slim’s first book, Escape from Cubicle Nation, provides advice and guidance for those contemplating going out on their own that is both practical and inspirational. Slim makes clear that becoming an entrepreneur does not produce fortune overnight – and that “hating your job intensely is not a business plan” – but she also encourages would-be entrepreneurs to “unleash their inner tiger,” the creative, vibrant part of themselves that is constrained by their fears and the expectations they and others place upon them. Slim has been featured in numerous publications, including Business Week, The Wall Street Journal, Entrepreneur, USA Today, Psychology Today, and US News and World Report and her book tour has taken her to Portland, the Bay Area, Seattle, Chicago, Charlotte, Atlanta, San Francisco, and New York with Dallas and London to come and more cities likely to be added. Slim lives with her husband and three children in Mesa, AZ and can be found on the website at www.escapefromcubiclenation.com. Folow her on twitter: @pamslim.